DOT Final Rules have now been written into law and added to the Federal Registry. Rules that have been in place for many decades have now been changed, disrupting the entire Transportation Industry. The days of Paper Logs are almost over. Motor Carriers will soon be required to equip all their vehicles with ELD Compliant Solutions that enable drivers to produce ELogs. ELogs by Safety Track is the answer! Safety Track’s Elog System is an ELD Compliant, affordable, state of the art, ELogs Application that will simplify the new complex rule sets that have been released by the DOT. A clean, crisp, user-friendly design ensures the best possible user experience for Drivers. Electronic Driver Logs are easy using our Mobile Application. Users of the system will have no problem navigating through the system with its Advanced Driver Dashboard. All features are readily available using large buttons and printmaking them easy to see and very visible. Our ELogs (ELD) Solution provides you with the tools you need to run your fleet effectively and efficiently. It has a Drive Interfaces Device (MDT), Engine Diagnostics, Electronic Driver’s Log, and Real-Time Tracking Capabilities. It has the Lowest Failure Rate in the Industry and be Manufactured By One Company. With our ELog System, you can even add a camera System and LIVE STREAMING Vid eo. Make the right Decision. We understand the Trucking Industry’s needs and provide the best in class service, bringing our knowledge of industry standards to you. Let us know what your concerns are and we can offer you a solution that fits your needs. Call and see why so many use our ELogs – Fleet Management System. Click to see our Training videos for each area of your fleet. The Electronic Drivers Log from Safety Track gives you, the fleet owner, the ability to maintain and manage your fleet from a new perspective. Not only do you have an award-winning tracking system, supported by a staff of over 50 engineers, you have available, some of the latest Fleet Management System tools in the industry. All under one product line. If you are new to the Fleet Management System market you can take advantage of the most versatile and complete tracking solution today. Safety Track offers you all of the real-time tracking features you have come to expect from a world leading Fleet Management System manufacturer.Give us a call to see how we can help you with your questions regarding the implementation of ELogs into your fleet. Drivers Tagged Out of Service? Hours of Service Non-Compliance Violations? Spending Countless Clerical Hours Tracking Fuel Expenditures? Fleet owners need a way to track and maintain full reports on the number of hours driven, miles and hours. Gone are the days of paper logbooks with hand-written times. Now you will have the ability to track hours/miles driven per day, per week and how much rest time is needed. With your full reporting features, you will be notified when rest time is needed and see hours on and hours off. The new feature of creating custom reports specific to your needs is virtually limitless. Everything is at your fingertip. This can change the way you do business. Our Elog System is fully ELD Compliant. Motor Carriers can continue using this version without having to transition again prior to December 2019 when the mandates go into full effect. 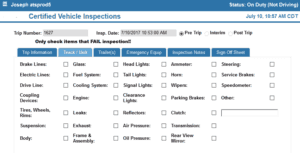 With the integrated Vehicle Inspection Report (DVIR) allows the Driver to log the Pre-Trip and Post-Trip Vehicle Inspections as required by DOT Regulations. An Interim Inspection also allows the Driver to perform spot check inspections during the day when necessary. The IFTA Fuel Tax Module is an affordable add-on service to the ELogs Application Suite, which uses several useful reports that can be printed including Mileage Reports by Vehicle, Fleet, Driver and Fuel Type. With our “Elog Checklist” of things to look for, we walk you through making the right choice. Call for this simple “To Do” ELog questionnaire to see how easy the implementation of our system into your fleet can be.